It isn't difficult to understand that debris in your gutters and clogged downspouts render the whole system useless. The purpose of gutters is to catch and divert rainwater (or melting water from frozen precipitation) away from the home and foundation. But what really happens when the system doesn't work? 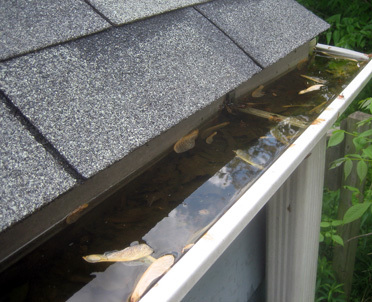 Water trapped in clogged gutters can cause wood-rot damage to a wooden fascia, and water that spills over and hits the ground can cause landscape and concrete damage, and the splashing water can also eventually damage doorways, garage doors and the bottom portions of siding or decks to rot. Water that splashes over can also end up in your basement and can cause many different problems including rot, foundation damage, and mold. And if that isn't bad enough, there are numerous insects (termites, roaches) that love the damp, dark conditions of rotting wood. The good news is that most all damage can be repaired. The bad news is that most all of these types of repairs (wood rot, mold, foundation cracks, etc.) aren't cheap. or ice to flow off the roof and away from the house. 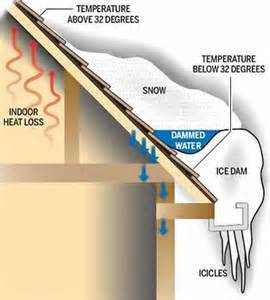 This prevents any standing water from refreezing, which is how ice damming occurs (see illustration). Clean gutters aren't a guarantee that damming won't happen, but clean gutters are a major preventative step. Any wet debris in gutters will freeze when temperatures fall below 32 degrees. The freeze and thaw action that cycles throughout the winter will loosen connections. This can lead to gutters actually pulling away from the house. When this happens, water can go behind the gutter and cause damage to the fascia or walls. All gutters should be inspected at least once per year. Tree debris is not the only thing that clogs gutters. Roofing debris, granules from roofing tiles, varmints, bird's nests, and toys are known to clog gutters. 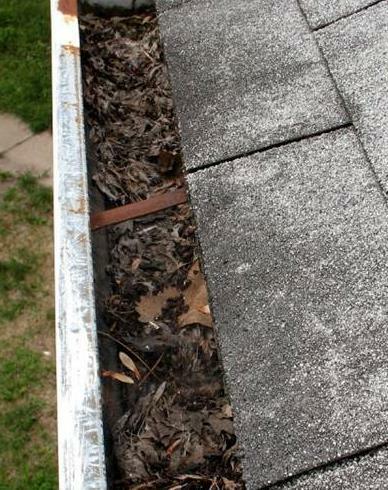 Most gutters require inspection and cleaning twice a year; in the late spring and late fall. If you are surrounded by mature trees, you may require cleaning 3 or even 4 times a year. If your gutters are clogged now, don't wait until the end of the fall, before getting them cleaned as rain may be causing damage now. Schedule a cleaning now and another cleaning again before the heavy winter weather happens. Next year you can return to a late spring and late fall schedule. If your gutters are relatively clean now, you can wait until after the majority of leaves have fallen before scheduling the last cleaning. Don't wait for all the leaves to fall, instead schedule when about 80% are off the trees or you risk problems if there is a sudden storm or cold snap. after-market covers that are installed on your existing gutters. Most are installed on top, but there are several inexpensive products that actually lay in the gutter pan itself. Most agree that the performance of gutter covers can run the spectrum from effective to obstructive, and costs run anywhere from a few dollars per foot to well over $20 per foot. Rigdon carries and installs only one type of cover and we've found it to be extremely effective. Our November newsletter will expand on the subject of gutter covers so stay tuned for more information next month. Our cleaning process at Rigdon includes a full gutter inspection and tune-up. We check all connections and fasteners, adjusting them as needed. All debris and clogs are removed and bagged (we'll take it with us), and we flush the system with water as needed. Checking all areas for clogs and inspecting connectors and fasteners is critical, as you learned earlier in the article, to be sure the system is fully functional. There are many companies and individuals who offer gutter cleaning but unless they also inspect and tune-up as well, your gutters may be clean but could still be loose or leaky. Rigdon also offers repair services including caulking leaky connections and installing gutter hangers. and if gutters aren't cleaned and inspected, you may be facing expensive repairs in the future. Call us to book your gutter cleaning appointment. Be sure and take advantage of the 'Early Bird Special' listed below to save on your gutter cleaning.